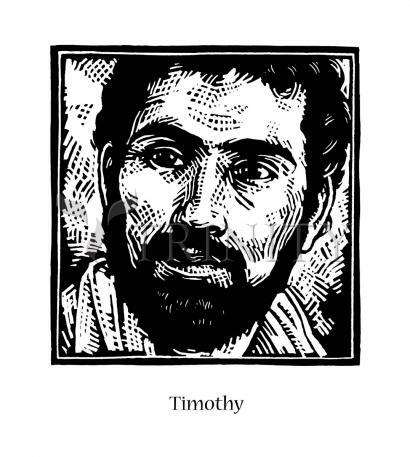 Timothy is one of the first generations of Christians in the New Testament. His father was Greek and his mother, Eunice, was a Jewish-Christian. His grandmother, Lois, was the first in his family to become Christian. Timothy became an associate of St. Paul, helping him in his work in the churches at Corinth and Esphesus. Most likely, Timothy became the leader of the church at Ephesus at a young age. While we have little information about Timothy's work as leader of this community, we know from St. Paul that leadership in the early church was a difficult task, particularly for a person so young. The leader of the community was required to exhort people to live according to the spirit of Jesus Christ. Sometimes this meant recognizing the ways that the Gospel was at work in a specific group and other times it meant telling a community when it was failing to live as Jesus Christ. Just as Paul was frequently despised for his leadership, one can assume that Timothy also suffered because of the Gospel. In fact, legend tells us that Timothy was stoned and beaten to death for preaching against a pagan festival in Ephesus around the year 94. His feast day is January 26. St. Timothy was born in Lystra, Lycaenia, the son of a Greek father and Eunice, a converted Jewish mother. Eunice, her mother Lois, and Timothy embraced Christianity during Paul's first visit (2 Timothy 1:5) to Lycaenia. When St. Paul preached at Lystra seven years later, Timothy replaced Barnabas (Acts 16:1-4). The two became close friends, and St. Paul would write of him affectionately as "the beloved son in faith." Since Timothy was the son of a Jewish woman, St. Paul permitted him to be circumcised to satisfy the Jews (Acts 16:3). He accompanied St. Paul on his second missionary trip. When the opposition of the Jews compelled St. Paul to leave Beroea, Timothy remained behind to baptize, organize, and confirm the new converts in the faith (Acts 17:10-14). He was then sent to Thessalonica to investigate the status of the Christians there and to shore up their faith in the face of persecution. His report was the basis for St. Paul's first letter to the Thessalonians (generally thought to be the earliest New Testament writing). In 58, Timothy and Erastus went to Corinth to reinforce Paul's teachings. Then they accompanied St. Paul into Macedonia and Achaia. It is probable that Timothy was with Paul when he was imprisoned in Caesarea, and again in Rome, where he himself was imprisoned for a time, then freed. Tradition, recorded by Eusebius, has it that Timothy went to Ephesus, became its first bishop (some say consecrated by Paul), and was there stoned and clubbed to death after denouncing the pagan festival of Katagogia, a celebration that honored Dionysius (not Diana, as often stated). St. Paul directed two letters to Timothy: one from Macedonia about 65, and one while Paul was incarcerated in Rome, awaiting his own death. They directed Timothy to correct innovators and teachers of false doctrine and to appoint bishops and deacons. Timothy manifested such virtue and dedication that he merited great praise from Paul, such as that in 1 Corinthians 16:10. Timothy's relics were allegedly transferred to Constantinople in 356; cures at that shrine are mentioned by St. Jerome and St. John Chrysostum. In art, St. Timothy is often a bishop with a club and stone. Sometimes he is shown receiving the epistle from St. Paul or being stoned to death. He is invoked against weakness of the stomach because of Paul's words addressed to him in 1 Timothy 5:23: "have a little wine for the sake of your stomach and your frequent illnesses."